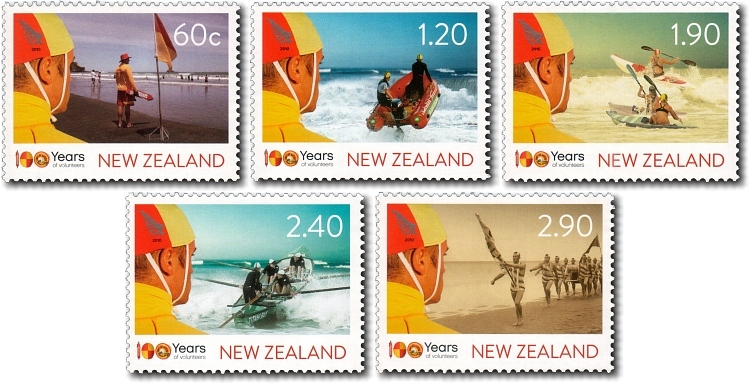 Summer 2010/11 marked a century-long legacy of heroic service on New Zealand beaches, and New Zealand Post celebrated with the 100 Years of Surf Life Saving stamp issue. 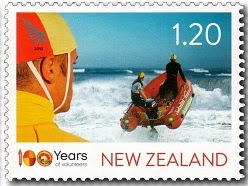 This interesting stamp issue depicted surf lifeguards in action - patrolling beaches and rescuing swimmers in heavy surf on beaches up and down the country. 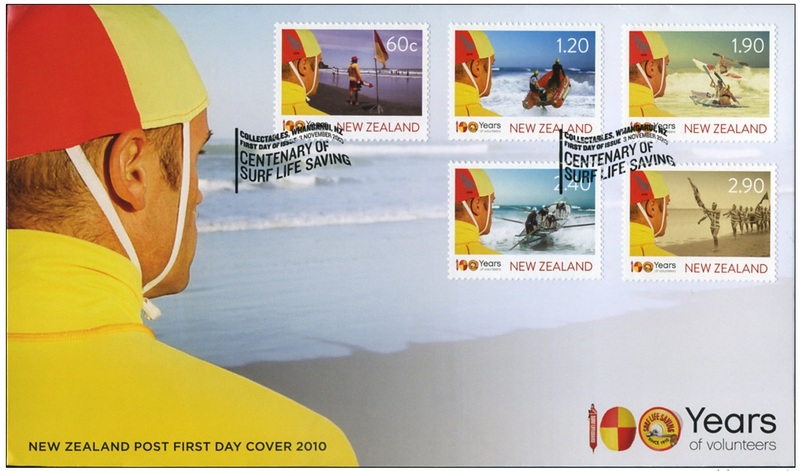 Each stamp depicted an aspect of Surf Life Saving, and all five stamps were captured together on the first day cover. I like the way each design through this whole issue had a common theme of the lifeguard on the left, always alert, always watching what is going on. 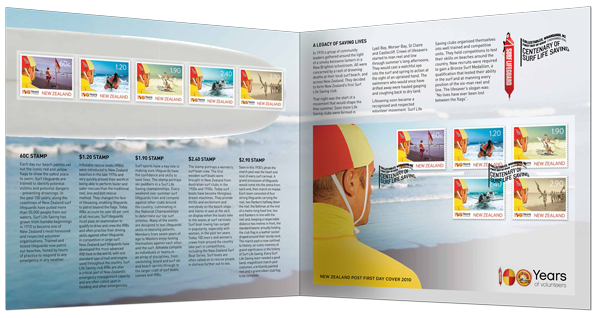 Also available was a special presentation pack, in which Bob Harvey, President of Surf Life Saving New Zealand, tells the story of the Surf Life Saving movement in New Zealand. 60c - Surf Lifeguard On DutySurf Lifeguard On Duty. A surf lifeguard on duty with a rescue tube. 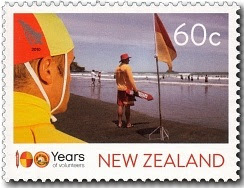 Throughout the year New Zealand beach patrols set out iconic red and yellow flags to show beach-goers the safest places to swim. $1.20 - Inflatable Rescue Boat (IRB). An Inflatable Rescue Boat (IRB) in the surf. IRBs were introduced to New Zealand in the late 1970’s and quickly proved that they could perform faster and safer rescues than the traditional reel, line and belt rescue method. 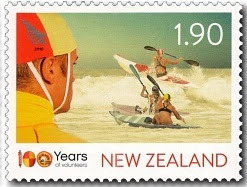 $1.90 - Ski Paddlers / Surf Life Saving Championships. Ski paddlers in the Surf Life Saving Championships. Surf sports play a key role in making sure lifeguards have the confidence and skills to save lives. $2.40 - Womens Surf Boat Crew. A women’s surf boat crew at a surf carnival. 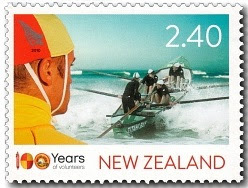 The first wooden surf boats were brought to New Zealand from Australian surf clubs in the 1920s and 1930s. $2.90 - March Past Team / circa 1930s. A march past team in the 1930’s. 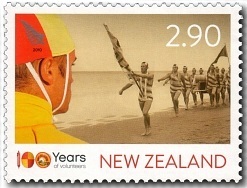 The march past was the heart and soul of every surf carnival. A grand procession of lifeguards came into the arena from each end, then marched together en masse. Special presentation pack, in which Bob Harvey, President of Surf Life Saving New Zealand, tells the story of the Surf Life Saving movement in New Zealand. These stamps remained on sale until close of business 2 November 2011.